The Webinar's main objective is to trade with the market trend. 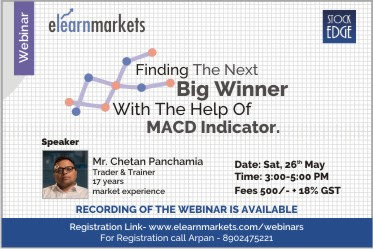 Risk reward is the main focus of webinar. For positional client risk-reward of more than 1:5 and 1:7 is easily possible. This course is great for beginners who are still learning the financial markets. This is a comprehensive strategy for profiting from low-risk, high-probability technical entries on any chart interval. A trader who is willing to commit to creating a simple analysis procedure and testing the system to ensure that they are consistently profitable prior to taking real trades. Beginner, intermediate and professional stock, option and index traders in search of a method for consistently outperforming traditional investments and managing risk. The importance of MACD as both a trending and Anti trending tool. Basics of markets or technical analysis. KINDLY ARRANGE AN WEBINAR FOR STYLES OF OPTION TRADING AND IF POSSIBLE, THEN FOR MCX MARKET ALSO.